This thing sounds as good as my Monitor Audio Silver LCR. BIC America has some of the best sounding speakers at a price that is ridiculously cheap. Great product BIC!!!! It seemed appropriate to adorn Ed Frias' good name with another garland in a long list of positive reviews. As a satisfied owner of BIC America speakers for at least a decade I recently started seriously considering upgrading my system. Music quality was my main ambition with HT as more of an afterthought, rather than a significant consideration. So it began. Scouring the internet for quality, and budget friendly, options. Everything from sound baffles, bass traps, diffusers and speaker placements ad nauseum. I looked on Craiglist, Youtube, Amazon, eBay, and retailers galore for information and reviews to inform and guide me. That was how I chanced upon Mr. Ed Frias. What a topic of research he turned out to be! After reading reviews about his personal line of high end speakers (EFE Technologies) I happened upon several articles and reviews of his crossover modification wizardry. While an extremely interesting read, I have to admit, I had no idea what was being crossed over or even why is needed to be modified. That is where I was for several weeks. I then came across an article about how he dramatically improved the sound of the BIC America DV62si bookshelf speakers. I have 4 of them. It was a few days before I had the idea of buying more of what I already had. That would be my BIC America,DV62clr-s, center channel speaker. A great speaker with great reviews. Also...great sound. Or so I thought. That is when I had (in my mind) a marvelous idea. Why not upgrade by replacing 2 of my bookshelf speakers with 2 more center channel speakers from BIC. Enter Mr. Ed Frias. I found Ed's phone number and gave him a call. I enjoy listening to music but have no experience with speakers or audio technology to speak of at all. I didn't even know if you could use a center channel speaker for stereo. (Turns out the CLR stands for Center - Left - Right) Chalk one up for humility! And this was learned only while talking to Ed. I explained my idea and he graciously explained to me that I was talking about something that he specialized in with the BIC America center channel. Taking this very good product and doing extensive crossover modifications to them. I couldn't believe it. I was thinking on the right track. I ordered two of these speakers and sent the crossovers for my current center channel along with the crossovers for the two bookshelf speakers that would be my surrounds and sent them to Ed for modifications as well. This was so everything matched acoustically. Good idea, that! I have had the new speakers and the three crossovers back, installed and playing for over two weeks. While I have never claimed to be an audiophile I am hereby claiming that my flabber is gasted. The sounds I am enjoying from these two speakers along with my sub woofer, that is rarely called upon, is way, way more than I could have anticipated. The speakers step out of the way by not demanding personal attention to their location or contribution and just provide wonderful, glorious sound. I can't imagine how I could be happier without spending several thousands of dollars and then only benefiting with marginal improvement. My system is simple and my speaker placement is, I believe, fairly basic. I run everything through an Onkyo TX-NR747 AV Receiver with 110W at 8 ohms. My CD/DVD player is a Samsung BD-J6300 blu-ray. No turntable, no additional amplifier. Basic and beautiful. The speakers are approx 18" from each side and rear wall with a slight toe in toward my sitting area. If it wasn't for a book case I can't move I do not think toe in would be needed at all. . My 10" down throw sub, also a BIC America, is set approx 24" from the rear wall and 36" from the side wall. My sub volume is at 3/10 and the cross over is at 75 Hz. The room is 12' X 21' with 7' wood ceiling. The walls are wood, drywall and polished concrete. Still, no need for acoustic room treatments. The speakers are adjusted just that well. A friend of mine visited to help me understand why his several thousand dollar system was such a better practical sonic value. Let's just say there was significantly more gasting of the flabber! He was impressed in the extreme. And, I suspect, silently envious at the value to cost disparity I had received from Ed Frias. In conclusion I would like to say "Thank you" to Mr. Frias for his time, patience, counsel and wonderful speakers. This is not a paid or reimbursed review. It is the appreciative missive of a retired fellow in Indiana that is grateful that craftsmen like Ed Frias are still available and admirably providing service to folks like you and I.
Mr. Frias can be reached at 1-928-778-2616, or efespeakers@centurylink.net, if you are seeking similar results. I recently purchased a BIC DV62CLRS from EFE (Ed Frias Enterprises). I had been searching.... make that scouring, the net for center channels that would be the best possible sound without taking out a mortgage on my home. Just before I was about to fork over a hefty sum for a Klipsche, I read through an AV blog that mentioned this center channel and the Ed Frias modification he does to them. After contacting Mr. Frias (efespeakers@commspeed.net) I was surprised to see his prices on the speakers he builds were lower than the factory built brand names I was looking at. I was skeptical at first but continued to find posts on the net that highly praised these speakers that came from Ed. So like everyone who had written those posts.... I drank the Kool-Aid and purchased one of his "extensively modified"center channels. All I have to say is WOW. The sound that comes out of this speaker is nothing short of amazing. It is so clear that even my wife made a comment about it and she is a hard one to impress when it comes to home theater. If it plays a sound (of any kind) she is satisfied. This speaker, however, made her sit and listen to her favorite movie soundtrack from start to finish! This speaker is not so dominant that it puts my other speakers to shame but the range this unit is capable of helps bring out all sorts of sounds I'm not sure I was able to hear before. The highs are crips and clear without being overly harsh. The mids and low ends have more punch than I had with my previous Infinity center. I gave the speaker a workout with my favorite movie, Transformers, and I could certainly tell a difference right away. The robots actually sounded like they were changing right in my living room!!! I moved on and gave the speaker the musical test and it had no problem producing every chord of Rob Pattinson's acoustic guitar to hard hitting Linkin Park and their song "New Divide". Dollar for dollar, I am not sure you can find a better speaker and would HIGHLY recommend purchasing one of Ed's. He is great to work with, answers all your questions in a timely manner and his work is first class. Some people out there may have their doubts but I recommend do like I did.... drink the Kool-Aid with the rest of us who have purchased this speaker. You won't regret it! Summary: The speaker is now CV62CLRS and has much smaller dimensions, plus the 6" woofer is now 6 1/2". The good part is the sound is actually better with the upgrades. After reading all the teriffic reviews of the BIC DV62CLRS speaker I purchased 3 for the front of my surround system. Out of the box I thought the speakers sounded great (albit, a little bright) and decider to give them a little time to break in. I contacted Ed Frias @ EFE and decided to go ahead and have the crossovers modified on all 3 speakers. After installing the modified crossovers the speakers are simply amazing, with great clarity and detailed mids and highs. I also have some Older Mirage Towers (12 Years Old) and the Modified BIC DV62CLRS simply have better detail and clairity as well as better depth and transparancy! I'm blown away with how good these 3 speakers sound and I have a little over $450.00 in all three! I took the gamble and decided to purchase 3 for the front of my home theatre/surround sound system and now my Older Mirage towers are relagated to the den for 2 channel stereo listening. I simply don't understand how speakers costing a little over $120.00 (without the crossover mod) a piece can out perform speakers I paid over $800.00 a piece for......But they DO! I highly advise the skeptics out there to just purchase these and let ED Frias work his Magic! This has to be the Best $450.00 I've ever spent on any audio purchase! Very detailed, can understand dialog at even low volumes. Great midrange, and lows for a center channel. WOWEEE. I have researched center channels for about the last year-year and a half, and I kept hearing about this center channel. I purchased the 62-S model last week, and it arrived 3 days ago. Out of the box I was inpressed by the shear size. Once I took my miniscule center out and swapped I was amazed!! Everything was soooo clear!! I could understand what people were saying at low volumes, and once turned up....Well....I was just amazed!! It even brought out some subtle sounds from music also. It hasn't even been broken in yet, and already sounds superb!! I thought long and hard about the crossover mod, and read an unbiased review on another site that made me think otherwise. Now that I hear the factory version, I don't think there is a need for the mod at all. At least not to my ears (and I'm kinda hard of hearing). Don't think.....just buy. You won't be sorry. I know I'm not. Have heard other centers in the store ranging from about $50-$300, and none of them compared. There is alot of talk about these speakers.To modify, or not to modify?Maybe this will help you decide on what to do.This center channel speaker sounds great in the stock version, after break in period.It seems a bit bright for my personal tastes, the key words, personal tastes.Some guys I know love that sizzle and boom sound.That is what you get with the stock version, not a very detailed and clear midrange.After listening to my stock version for about a year,I decided to send the crossover to Ed.I received the crossover in a very quick manner, installed it, and to my pleasant surprise the sizzle and boom factor was all but gone.This speaker became a accurate reproducer of audio signal.The tonal balance was remarkable.Very clear and defined mids, lows, and highs.I run everything flat on my head in, and this speaker sounds fantistic, for my personal tastes.So, if you think your speaker sounds good to you now, leave it alone, and enjoy, if you think it sounds a bit bright,spend the $20.00, send the crossover to Ed, and then enjoy.Either way you can,t go wrong with this speaker. Occuasional slight bass overlap with sub which i adjust mannually. Auditioned Altec Lansing, Bose, Infinity,Klipsch,Boston Aucustics,JBL,B&O,Pioneer,Cambridge Soundworks,Polk,Velodyne,Sony,HSU,Onkyo,Kenwood,and others most audio store stuff. Smooth, warm, natural sound with good clarity and detail, well suited to dialogue. A very good match with the Ar.com EFE DIY's. Very good bass response for a center channel, and good off-axis response. Solid MDF construction. Drivers and components tested, measured, and matched for optimal performance by Ed Frias, crossover completely redesigned using higher quality components!!! Not a pretty speaker. I honestly cannot complain for $160, but compared to my old Studio CC the midrange isn't quite as open and smooth. Neither is the CC-370 at over double the price! This is a great find!!! After our little experiment using these as bookshelf speakers, we decided to do some head to head comparison of the DV62CLRS and one of the center channels these were replacing. It was our intention to use the DV62CLRS in a center channel role. The incumbent center channel was a Paradigm CC-370 v.3 (retail over $400) I acquired last month after selling a more expensive Studio CC to help pay for the EFE DIY's. The tonal imbalance up front when mated with the EFE DIY speakers was very distracting. So we tried these out. The voicing on these is a very good match to the EFE DIY speakers, almost perfect. That alone made this a successful purchase for us. But just to satisfy our own curiosity continued with the comparison. I just left the power amp to the front main speakers off, so the front stage was ONLY the center speaker. After experimenting with placement options, we found the best method was to sit the DV62CLRS on top of the slightly wider CC-370, and use some foam to angle it down slightly so it fired straight on axis at us. Rear banana plugs made a/b switching fast and easy. From the start, it was clear again that Paradigm speaker is made with a relatively brighter tonal characteristic. Paradigm deserves credit, this speaker is very well suited for dialogue, but like the Monitor 5’s, it generated a bit of undesirable sibilance and hissing in vocals. Not much, but enough to annoy me. In fact, I was use to the sound of the CC-370 and only when listening to the slightly warmer sound of the BIC did this sibilance then become annoying. The Extensively Modified BIC DV62CLRS was clearly more forgiving to the high frequencies than the CC-370, and as such sounds a bit more natural. The midranges of both were fairly equal, it was hard to notice much of a difference in tonal characteristics other than the warmer sound mentioned above. The BIC does have a much lower bass response, and completely trumps the CC-370 in this area. Unfortunately the CC-370’s bass starts to roll off around 100 Hz and is pretty much all gone by 60 Hz… This is too common in a lot of center channel speakers under $800. The BIC nicely fills in the bass down to about 60 Hz while remaining reasonably tight and accurate (and actually extends even further). In a home theater application, this is a terrific feature as it allows you to set the crossover on the subwoofer at a lower point (60 Hz in my setup, I believe 40 Hz would be possible if my front mains allowed it). Before, there was a noticeable hole in the response between 100 Hz and 60 Hz in the center channel. This was really annoying when panning across the front 3 speakers. Not so with the DV62CLRS. For most movies, effects would happen so quick that you could get away with it, but the musical scores in a lot of films, and the new multi-channel audio formats like DVD-A and SACD (or even Concert DVD’s) really benefit from that lower frequency response in the center. The front soundstage is much more evenly balanced. Finally, we tried a crude test of moving off axis from the sweet spot to get a sense of the dispersion characteristics. All of the seats in our 18’x 20’ room were no more than 6 feet off center, so a 12 ft wide area was all we tested. Not much to report as far as differences from either speaker except the CC-370 became a bit bright sounding as you moved closer to the sweet spot, and softened up some as you moved off-axis. I suspect this plagues most center channel speakers. The response was a bit more balanced in the DV62CLRS. Both speakers performed very well in the midrange as we moved off-axis. I use to own a Paradigm CC-170 center speaker ($200) whose midrange response deteriorated terribly once you moved more than 2 or 3 feet of axis one way or the other. Everyone crammed on the couch. All in all I am quite impressed with the DV62CLRS in it’s center channel capacity. It really does match the voicing of the EFE DIY front main speakers I have, and just listening to the Extensively Modified DV62CLRS, you can tell it sounds far better than you'd expect for a $160 speaker, I'd say it's very close to the Paradigm Studio CC I had, though not quite as smooth sounding (can't have it all for $160). I don’t mean to pick on Paradigm at all, but the CC-370 was the only center channel we had in the same room to do this quick a/b comparison to. I believe Paradigm is quite competitive with other mainstream speakers. That being said, the DV62CLRS performs better than the CC-370, has better bass response, a slightly warmer, less harsh sound, and is $200 cheaper! I now feel completely hosed paying $500 for my Paradigm Studio CC, thank heaven I was able to sell that on ebay!!! 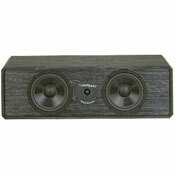 This speaker is an excellent choice for a center channel. NOTE: As before, to validate my claims, and prove I owned the speakers referred to in this review, I can send pictures upon request. Just search my profile here on audioreview .com and send me a personal message. Paradigm CC-370 v.3 (for about 1 month) and prior to that, a Paradigm Studio CC to match my Studio 40's and 20's. Warm,detailed sound. Wide, deep, 3D soundstage. Exceptional imaging. Dual ports give deep, tight bass for a speaker this size. Solid cabinet construction made of 1/2" MDF, not cheap particle board found in sub $1000 speakers like Paradigm, B&W etc - eliminates cabinet resonance. Clear highs. Very real, and natural voicing! Superb midrange performance...midrange should not be as good at this price! GREAT VALUE!!! Looks, she ain't pretty. Size...might provide difficulty on smaller TV sets. Bass tends to boom a bit below 50 Hz like many other speakers below $1000. But if using the receiver's LFE cutoff and a sub, this goes away! This is review 1 of 2 of the Extensively Modified BIC DV62CLRS bought from Ed Frias, my cousin and I each ordered 1, and at Ed's suggestion, gave them a thorough listening as “bookshelf” stereo speakers for a week next to my cousin Greg's Paradigm Monitor 5's so we could do some quick a/b switching. The Monitor 5 (v.3) sell for over $600 USD, and I would describe them as one of the better bookshelf speakers in the $500-$750 range I’ve heard. I must admit, we found this comparison quite surprising. Upon placing the BICs on 29” stands, we both had to admit that they looked a little odd compared to what we’re use to. It looks much better as a center channel placed horizontally than vertically, but it’s not an eyesore. We felt we’d best reserve our judgment for how they SOUND, because let’s face it, BIC is a virtual no-name brand to most people, with pretty average looks. Throwing in some classical music (the Deutsche Grammophon recording of "Carmina Burana", Gladiator, Rachmaninov Piano Concertos 2-4 etc) a few differences became immediately obvious. The Paradigms are just a tad bit brighter (which some may prefer) and a bit more airy. This lends itself to providing a bit more detail on some instruments, but becomes a bit scratchy and too harsh at times as well, a trade-off I’m not too fond of. The BICs don’t share the slight hissy sibilance in vocals that the Paradigms exhibit. Points earned there! I found the bass response of the DV62CLRS to be just as smooth, and even a bit tighter, though perhaps not quite having the same bottom end extension. Compared to the BICs the Paradigms seem to carry just a bit of "boom and sizzle" and didn't image quite as well (in truth, the BICs seemed to image almost as well as my $1200 Paradigm Studio 40’s!!!). The DV62CLRS had just as wide a soundstage as the Monitor 5’s but had a more distinct separation of instruments. This in my opinion was the most obvious difference, the Monitor 5’s have a reasonably wide soundstage and decent imaging, but compared to the BICs they lack depth and transparency. The midrange was warmer sounding and arguably a bit more natural in the BICs. The voicing on DV62CLRS is very well suited to music. I also found the DV62CLRS to be not quite as forward sounding, and I dare say a bit more pleasing for a lot of the female jazz singers I listen too than the Monitor 5’s, though some may prefer the punchy, forward sound of the Monitors 5’s for rock music. We played Diana Krall’s “Love Scenes” and “The Girl In the Other Room”, and a few Norah Jones CD’s we were familiar with to get a feel for the female vocals, and some good acoustic instruments. The Bics do well! One thing I noticed immediately was the Paradigms sounded relatively boxy, and you could definitely tell the music was coming from the speakers...the BICs had a tendency to "disappear" a bit more... If the Monitors 5’s had anything on the BIC DV62CLRS it would be efficiency and the ability to play ear-bleeding loud. The Monitor 5’s I believe would perform a little better in a very large room. The room we used is a spacious 20 X 18, and in a much larger room, I would probably recommend that people consider going with Ed Frias's Extensively Modified BIC DV64 towers, or the BIC DV62si’s and a good subwoofer. Given these subtle nuances, I can honestly say at $320 a pair, the “extensively modified” DV62CLRS is quite an impressive value, and a great performer as bookshelf speakers...and that’s not even what we purchased them for!!! Surprise, surprise!!! In a stereo setup, I would argue these easily match the performance, if not outperform the Monitor 5’s. This may reflect my personal taste for a slightly neutral to warm sounding speaker…the Paradigm’s certainly exhibit more brightness, and have a bit more bass extension. I’d still use a subwoofer for both speakers, so the bass becomes a moot point. Eliminating these slight differences, it’s impossible for me to say that the Monitor 5’s are really any better than the Extensively Modified BIC DV62CLRS, and given that the price for two extensively modified DV62CLRS speakers is about HALF that of the Paradigm Monitor 5's, I really feel the extensively modified DV62CLRS is one of the best kept secrets in the industry. These DV62CLRS are far beyond what I’ve come to expect from speakers in this price range. Sure, they’re not perfect, but they exceed expectations...For people looking at a decent set of speakers in the $400-$600 range, these would be perfect! These DO NOT sound like a $320 pair of speakers and rival many more costly models I’ve owned!! NOTE: I often believe reviewers compare with speakers they DON'T OWN! I personally have all the speakers named in this review, and will provid anyone PROOF via pictures to validate my claims!!! Just e-mail me. This review does not refer to the stock BIC DV62CLRS, just the EFE modified one! My hope is to prove these are real GIANT KILLERS! Paradigm Monitor 5's (v.3), Studio 20's and Studio 40's (v.2) Secondary stereo system in basement - Wharfedale Emerald 93's. Dining room system - Axiom M3Ti's.